Get your FREE 37-point checklist! 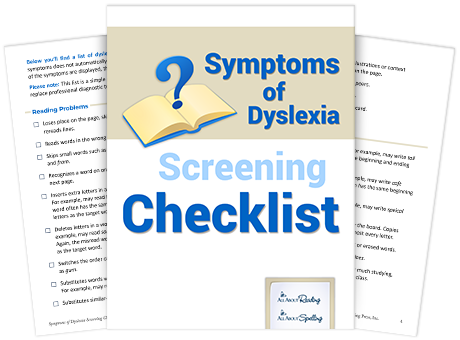 Complete the form for instant access to your “Symptoms of Dyslexia Screening Checklist." 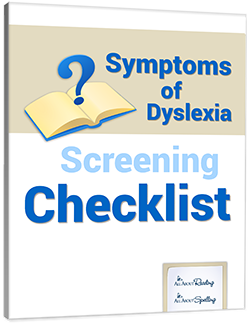 Our free Symptoms of Dyslexia checklist is designed to help you determine if your child has the signs of dyslexia. Dyslexia is a common reading and spelling disability, affecting approximately 10% of students. Symptoms vary from person to person, and this checklist will guide you in determining whether your child may be affected. If your student shows the signs and symptoms of dyslexia, reading and spelling can be very difficult to learn through traditional methods. The good news is that the brain can be rewired through a systematic, explicit phonics approach, such as the one used by All About Reading and All About Spelling. As you work through this checklist, feel free to jot down any questions you may have. You can email us at support@allaboutlearningpress.com, or call us at 715-477-1976. No question is too big or too small—we’re here to help!